Considered as one of the most trustworthy antivirus solutions in today’s market, Norton – which is developed and distributed by Symantec, a global leader in cyber security – provides wide-ranging antivirus protection for different devices. Aside from being certified for malware detection and removal by West Coast Labs and ICSA Labs, Norton has also earned a perfect score from the AV-Test Institute. This antivirus has also been examined by other independent bodies, and was found to have identified and blocked about 80% of recognized threats. Easy to install and very user-friendly, Norton Antivirus is regarded favorably for its highly intuitive system of detecting and removing viruses and other threats – therefore making it a delight to use, especially for users that are not very tech-savvy. Norton Security Standard (from $39.99/ year). Gives your Windows PC or Mac comprehensive real-time protection that cannot be found in free antivirus software. Norton Security Deluxe (from $49.99/year). Single subscription that delivers 100% virus protection for up to five Windows PCs, Macs, iOS or Android devices, thereby safeguarding your identity and online transactions and alerting you about risky apps and programs, so you can avoid downloading them. Norton Security Premium (from $59.99/year). Delivers protection for up to ten Windows PCs, Macs, Android or iOS devices through a single subscription that helps safeguard your identity and your online transactions as it protects you from ransomware and risky downloadable apps while helping you control your children’s Internet usage. Norton antivirus is fairly easy to install, guiding users with a step-by-step procedure as the installation progresses. The software installs quickly and does not take too much space, as the application has a smaller size compared to other antivirus programs. Not only is the software quick and easy to install. The whole program is also easy to use. If you need to perform a quick scan, do a full scan on all of your computer’s drives, make backups of your files or execute performance optimizations for your system, you can do so with just a single click. With a user-friendly and highly intuitive interface, Norton’s easy to read dashboard has all you need todetect and remove threats that can compromise your computer system. Both AV-tests and individual tests performed on the software has shown Norton achieving a perfect score for detecting zero-day malware and widespread malware, whereas the protection most antivirus software give against zero-day malware is 98%. However, Norton was found to identify legitimate software as malware four times during a scan, whereas the most antivirus programs make only three mistakes on average. Customers are provided with a variety of customer support options that include a knowledgebase of articles and an FAQ section found in the Norton website, phone support, chat support and even a forum where Norton users can ask questions about the software and share experiences and solutions to different issues with the software. However, support for more advanced concerns and technical help is not free; you must purchase different support packages if you want higher-level concerns resolved. Norton has average detection rates for viruses and threats, and its various packages are sold at reasonable prices, compared to the top antivirus programs in the market today. Norton antivirus does not only come with reasonable prices; every Norton subscription comes with a guarantee, which is called the Norton 100% Virus Protection Promise. This guarantee ensures that your device remains virus-free for the entire duration of your subscription, or you will be refunded the amount you paid for the software. In addition to the affordable price and the Virus Protection Promise, Norton also promises a 60-day trial period. If you are not satisfied with the antivirus for the first 60 days of your subscription, you get your money back. Real-time Scanning. Norton boasts of real-time virus scanning that blocks 80% of threats. However, it is easy to miss virus alerts because they just pop up on the screen and disappear all of a sudden. Spyware & Malware Detection and Removal. Norton is a widely recommended antivirus due to its efficiency not just in detecting but also removing threats immediately, even if the system is still being scanned. The antivirus has a 51% block rate for malicious URL, thereby protecting your computer against harmful websites. Email Scanning. PC Mag ran tests on Norton’s email scanning feature. Although the antivirus failed to detect 10% of the spam mails received, Norton did not block any valid email so you are sure that none of your emails will get directed to your spam folder. Protection against Harmful Downloads. 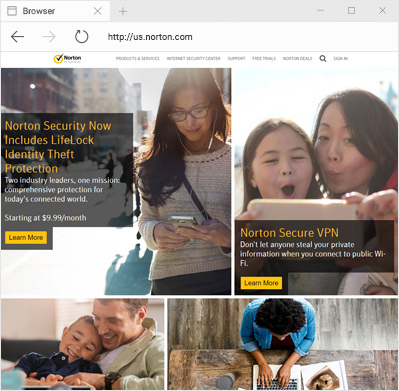 One of the features of Norton antivirus is the live site advisor, which scans online content to make sure that your web browsing is safe from spam, spyware and phishing. You also have the option to configure the settings for download protection. Parental Control (for Norton Security Premium). This feature allows you to restrict websites for all devices, so you can control your child’s Internet usage. The feature also includes reports on usage, so you can modify restrictions as needed. Full antivirus safety, firewall defense, identity and financial security, email scanning, spam blocking, password management and backup storage – depending on the package, these are just some of what Norton antivirus offers. Overall, Norton is an impressiveand ideal antivirus program, despite some areas that need to be improved on. How effective is the product at detecting, removing, blocking viruses, as well as combatting emerging security threats? Is the product easy to install and use or does one have to contact the support team for help first? Does the company offer free technical support to clients? What is the estimated number of people who are interested in buying the product and make a purchase? Is the product in line with the market needs? Does the company reimburse clients who are dissatisfied with the product? Does the company offer discounts and other special offers to customers? Antivirus is software that is programmed to protect your computer by identifying and eliminating the threats. Is Antivirus software effective in enhancing internet security? Absolutely YES! Up to date, more than 20 million viruses have been detected and eliminated safely. The best antivirus products have the ability to scan, identify, and combat these viruses. Who can benefit from antivirus software? Well, a large number of virus infections occur when people download suspicious files or visit insecure websites. Antivirus software will identify such viruses and delete them before they can harm your files. Can an Antivirus compromise the performance of my computer? A few years ago, they used to, but using the new technology, the manufacturing companies create antivirus software that is efficient and do not compromise the functionalism of the computer. What is the essence of opting for the paid antivirus? The free antivirus options provide basic protection while the premium antivirus products offer not only the basic protection but also additional features that are tailored to enhance your device’s security. How do I select the right antivirus? The first thing that you need to do is check the software features to know if they resonate with your security needs. You also need to check if it is compatible with you device’s operating system, security needs, and internet usage. What is the importance of having internet security suite? As the name suggests, an internet security suit is designed to protect you from threats as you browse the internet. The best come with firewalls and fourth generation detection algorithms that safeguard your private data especially when banking and shopping online. How is the role of a firewall? A firewall prevents cybercriminals from accessing your computer files while online. What should I do to scan and remove viruses? Antivirus has a scan feature that you can click on to initiate the scan. Once the scan is complete, you will get a report that contains the full list of the detected threats and infected files. You can either remove or quarantine the files. Is it possible to block popups using an antivirus? It is possible to block these popups by selecting a product that offers foolproof malware and adware protection. Does my Mac require an antivirus? The number of viruses that target Mac has increased over the last few years, and so it is paramount to install an antivirus on your Mac. There are antivirus products that are specially customized for Mac computer users. Is there a need to install antivirus on my smartphone and other mobile devices? There are thousands of mobile applications that you can install on your mobile device. Each of them can be exploited by cybercriminals to install malware hence the need to install an antivirus on these devices. The most critical and essential line of defense for all Internet users is to secure their system against invasions from malicious software. By opting for the most efficient and robust anti-virus software, you can ensure that your PC and private information are secured against potential malware. Why do I need an Antivirus Software? Having an active antivirus program installed on all your devices is the only way of combatting the various viruses. Once installed, you will enjoy browsing the internet freely knowing that your privacy and confidentiality will not be compromised. How to Choose the Best Antivirus? Protecting your personal computer from the various malware should be your number one priority especially if you are an active computer user. Here are five expert tips on how to choose the best antivirus in the market without breaking a sweat. Copyright © 2019 - 2020 Killer Reviews. All Rights Reserved. Reproduction in whole or in part in any form or medium without express written permission of Killer Reviews is prohibited.